The menswear label, which blends Indian authentic cloth making and dyeing techniques into western wear, was launched in 2016 and is currently sold through nearly 75 outlets including eight standalone stores in the country. 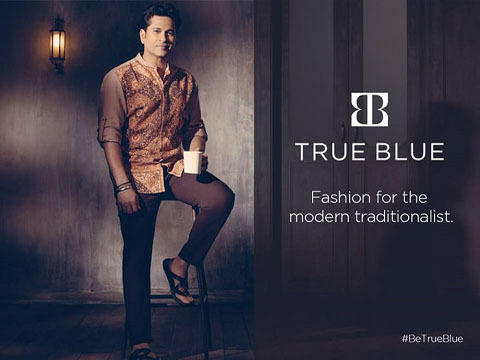 Former Indian cricketer Sachin Tendulkar is interested in making its joint venture clothing brand with Arvind, True Blue a global brand including the US and UK. “Whenever I travel, I am not surprised to see made in India tag in clothes. So why not an Indian brand in those markets?” the cricket legend told ET in an exclusive interaction. The menswear label, which blends Indian authentic cloth making and dyeing techniques into western wear, was launched in 2016 and is currently sold through nearly 75 outlets including eight standalone stores in the country. Incorporated in 1931, Arvind, the country’s largest textile company has gradually diversified into higher margin retailing business and now runs stores of nearly two dozen brands, including Gap, US Polo, Arrow, Sephora and Children’s Place as a licensee or JVs. It also owns brands such as Flying Machine, Excalibur and Ruggers. True Blue will be Arvind’s first owned brand to venture outside India and launch a wide range of verticals. “It can be extended into India inspired stationary, accessories or even women’s wear, where you can take Indian sensibilities and design elements and interpret,” said J Suresh, CEO at Arvind Brands & Lifestyle. “The opportunity is much beyond menswear but we can’t put a timeline for entry into these segments,” he said. India’s fashion retail market is worth $56 billion and is expected to grow at a CAGR of 7.7% to reach $103 billion by 2027, as per India Business of Fashion 2018 report. During its launch, Arvind group had said it is eyeing revenue of Rs 200-300 crore from True Blue in the next five years. The company has yet to file its 2017-18 results, the first full year for True Blue. Tendulkar said he is not worried about when will the brand will reach the Rs 100-crore mark. “When you start counting your centuries, they stop coming,” said the man who is often referred to as the god of cricket by many Indian cricket lovers.